Middlebury College students turn their backs to controversial speaker Charles Murray, unseen, during his talk at the campus in 2017. Paula Molina Acosta’s concerns for her own safety on her college campus first started to grow over a year ago. Molina Acosta studies at the University of Maryland, or UMD, in College Park, Maryland. In the fall of 2016, students began seeing the words “Build the Wall” written around the school grounds. This was a term then-presidential candidate Donald Trump used during the 2016 election to discuss security on the United States-Mexico border. Molina Acosta, who was born in Colombia, South America, says for students like her the words feel like a threat. Then in March 2017, a student reported seeing a noose hanging in the official housing of one of the school’s social organizations. Nooses have historically been used as weapons against African Americans, and are still seen as a symbol of racial violence. Two months later, an African American student visiting from Bowie State University was murdered on the UMD campus. A white UMD student suspected of the attack now faces charges of a hate crime. In light of these events, Molina Acosta says she wants her school to do more to limit speech and actions she says are hateful. The challenge, she notes, is balancing these limits with the U.S. Constitution’s First Amendment, which protects Americans’ right to speak freely. 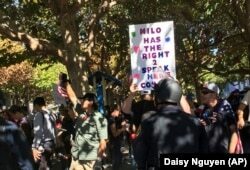 Signs supporting a planned speech by Milo Yiannopoulos in Berkeley, California on Sunday, Sept. 24, 2017 following a protest of another speech of his at the University of California, Berkeley earlier that year. A new study looks at exactly the issues Molina Acosta is weighing. The study finds that a majority of today’s college students in the U.S. value diversity more than protecting free speech. The study, released in March, is a shared effort from the research company Gallup and the non-profit organization the Knight Foundation. In 2017, the two groups asked over 3,000 college students from across the country about how much they valued diversity and free speech. 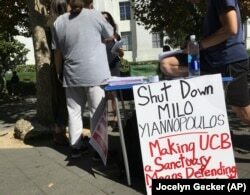 One of several flyers calling for protesters to "Shut Down Milo Yiannopoulos," at the University of California, Berkeley campus in Berkeley, California. Brandon Busteed is the executive director for education and workforce development at Gallup. He offers a number of reasons why students may value diversity over free speech. For one, the college student population in the U.S. has become increasingly diverse. Busteed points out that the majority of white students chose free speech over diversity. However, Busteed argues that the preference for diversity over free speech is not the only important point to come from this study. He notes that 56 percent of the surveyed students feel that protecting free speech is important to a democracy. And 52 percent say the same about including and protecting different kinds of people. So it is not like college students today place little value on free speech, Busteed says. But in some situations, students might feel they have to choose between the two. Still, Nico Perrino finds the results of this study troubling. He is the director of communications for the Foundation for Individual Rights in Education, which fights to protect free speech on college campuses. Perrino says the movement to defend free speech has long been challenged by another movement: political correctness. The term relates to the belief that words or ideas minority groups might feel are insulting or discriminatory should be avoided. Critics of political correctness say efforts not to offend can be carried too far. 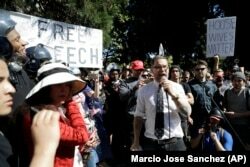 Far-right media personality Gavin McInnes speaks at a demonstration for free speech near the University of California, Berkeley campus. Many American college students identified with the politically correct, or PC, movement back in the 1990s, says Perrino. But he says the rise of groups like Black Lives Matter has brought renewed attention to it. The group campaigns on issues such as police violence against African Americans, as well as equality and understanding of the African American experience. Perrino argues it is the job of universities to welcome all kinds of ideas, especially ones that some people might find problematic. Otherwise students may not be able to fully examine those ideas and possibly solve the problems surrounding them. Also, diversity not only means including different races and ethnicities. It means accepting people who think differently from you, he says. Perrino says he has no problem with debating or peacefully protesting. But he worries that limiting hate speech may become a form of violence itself. What is more, he says, trying to silence speakers who express hateful views may accidentally result in supporting them. For example, Milo Yiannopoulos is a writer known for supporting ideas that many find offensive. In his speaking and writing, he has attacked Muslims, feminists, people whose appearance he does not like, and many others. In February 2017, he was supposed to hold an event at the University of California, Berkeley, but the event was cancelled following violent protests. In the weeks after, Yiannopoulos’s book became the top seller on the website Amazon. 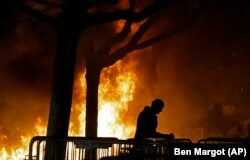 A fire set by demonstrators protesting a scheduled speaking appearance by Breitbart News editor Milo Yiannopoulos, burns on the University of California at Berkeley campus in February 2017. Perrino says students must understand that the U.S. Supreme Court has never provided a legal definition of hate speech. Therefore schools cannot limit a person’s speech, even if it makes another person feel unsafe. And that is with good reason, he says. Paula Molina Acosta of UMD agrees that open discussion between people who hold opposing beliefs is important, and violence is never the answer. Given the choice, she says protecting free speech is more important than diversity. But Molina Acosta does wonder if there is middle ground between the two sides of the issue. She admits that students may not be fully right in their aim of banning everything they consider to be hate speech. After all, she is only 19 years old and does not have all the answers, she says. But she also believes the next time someone draws an image related to Nazism, as was the case at UMD last October, university officials should take action. Pete Musto reported this story for Learning English. Kelly Jean Kelly was the editor. We want to hear from you. How do you think colleges and universities should deal with incidents of hate speech? Is there a middle ground on this issue? Write to us in the Comments Section or on our Facebook page.